Nice...I hate it when there's a huge gap between the pipe and the frame. I'm putting a shorty R1 Two Bros on my bike very soon. It's in the garage with my titanium headers. now that's a good way to save some cash. I can check my cables after work and let you know which goes where if you haven't found out by this evening. When i first tried to install mine they also didn't have enough slack. 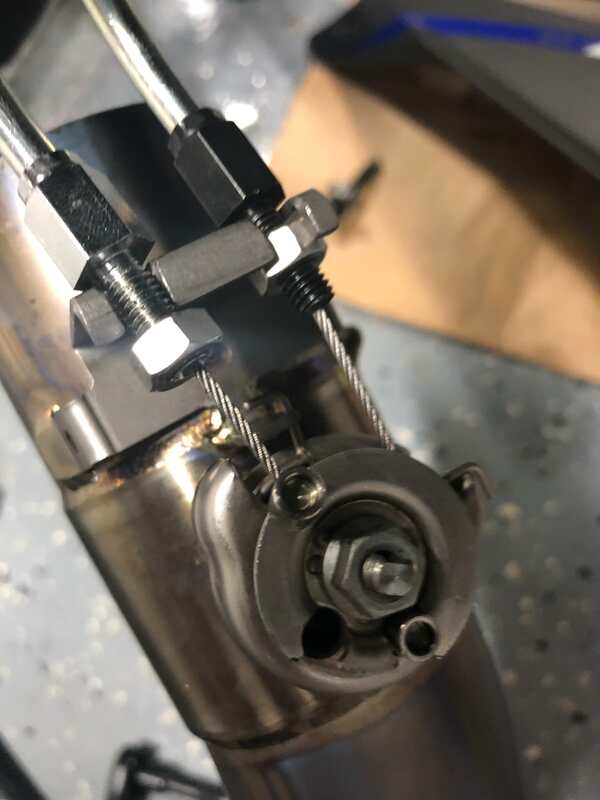 Have you backed the main adjustment nut all the way off? It's up by the passenger peg. That's what did the trick for me, but if I recall correctly I had to give myself as much slack as I possibly could. DAMN I LOVE THIS FORUM!!!!! No I didn't even know that was possible!!!! THANKS Achrista, will try this tomorrow and report back!!!!! 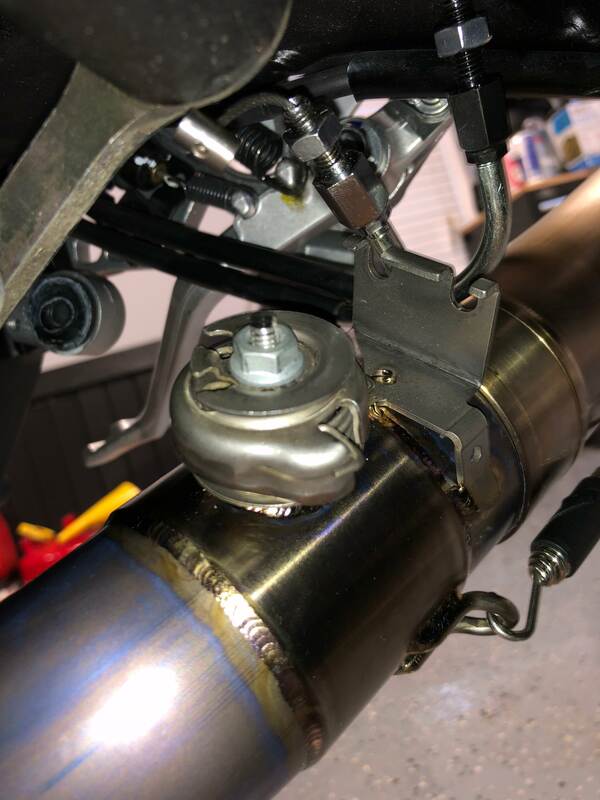 I just flashed the ECU (2wheeldynoworks) hooked me up with the email file (I have a bench kit), and DAMM THIS THING RIPPS NOW! Love it, thanks again for all the help. I just flashed the ECU (2wheeldynoworks ) hooked me up with the email file (I have a bench kit), and DAMM THIS THING RIPPS NOW! Love it, thanks again for all the help. That's awesome. It would be great if you could do a youtube clip of how the bench kit works. They make it sound like the bench kit is only for MotoGp technicians. I'm sure it's better to due the tuning for your particular bike as opposed to getting a one fits all ecu mailed. I would love to be able to play with all the features to really dial it in. A true dyno tune is best and that's what I want to do at some point. Love your exhaust...it's one of the best looking ones I've seen on our 10's. Glad to help. Graves should definitely make note of the exup cable adjustment in their installation instructions, because now I'm sure the MT-10 pipe they're selling is identical to the R1 pipe they're selling and they just recycled the directions as well. The fitment of your exhaust is great. 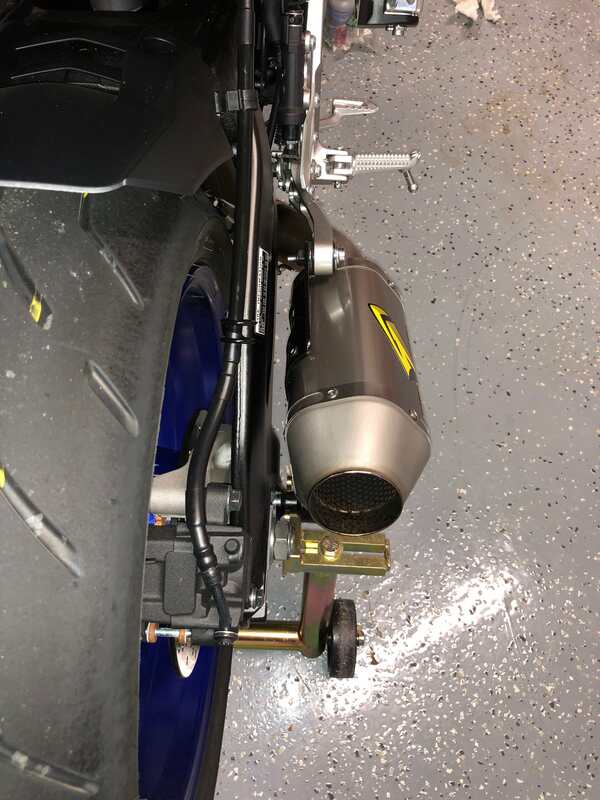 I prefer the carbon fiber to titanium can personally (bias being I own the CF can), but the angle you came up with follows the lines bike as well as my can does or possibly even better. Regarding the flash, that was quick. I'm glad they'll work with trusted individuals to provide a flash. i wish i had gone that route when I got the bike (instead of sending my ECU in) so I could go and get refinements made at a dyno, but such is life. Maybe if I bought a bench kit from them they'd hook it up. I ran into a few issues and had to uninstall and reinstall the FTECU software. It finally saw the ECU, charged me $100 for a new license and then I was able to apply the 2WDW tune file. Saved a few bucks and time by not having to mail in the ECU and just getting the file emailed to me. But I will say, in my short test ride last night the difference was night and day. No snatchy throttle even in Mode 1, and the sound was amazing. Like a hot rod V8. Can't wait to get it to the track (Maybe Barber with STT October 13). If I do, will def post some video of me passing sportbikes. I have the Graves EVR and a 2wdw flash and I put down 150 on a dyno. Caveat being the runs kept going up and I didn't see a true plateau, but I think 153-5 may be too optimistic. I'd be interested in seeing another evrs Dyno results. On Nels thread or sticky...he shows 154.73 with the Graves. I have a FZ10 of course, but I also keep my tuned FZ1...people on that forum claim they get around 150 hp. I've never put my FZ1 on a dyno yet, but she isn't slow...that's for sure. It's much heavier and is starting to look a little dated. I ride it to work everyday right now because the FZ10 is just beating the hell out of me on the road at speed. Don't get me wrong...I love bumpy fast roads...my FZ1 with real suspension just handles it all so well. I'll have the FZ10 totally dialed in a few months and give her a couple of shake down runs on Mines Rd in Livermore...then do a few trackdays at Laguna, Sonoma, ThunderHill & ButtonWillow. 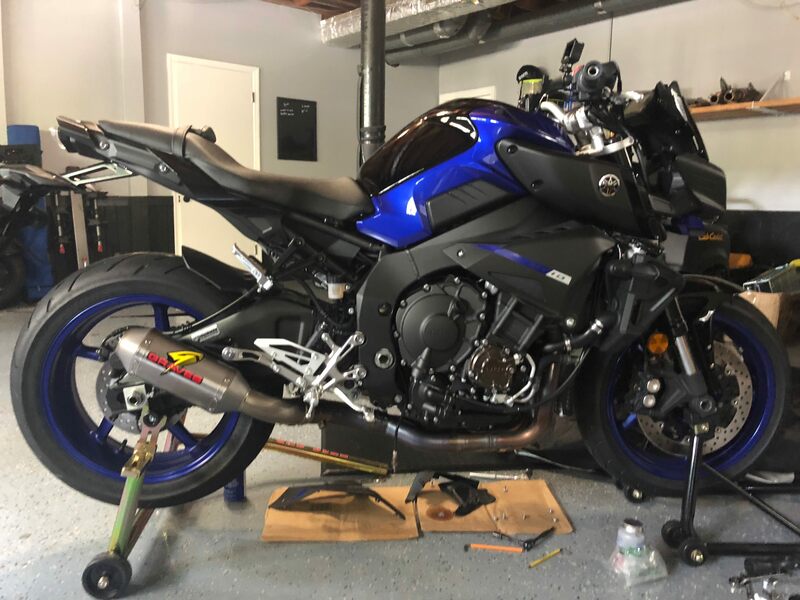 I'm totally committed to the FZ10...my FZ1 is just an older model that still has a place in my heart and will be in my garage for years to come. 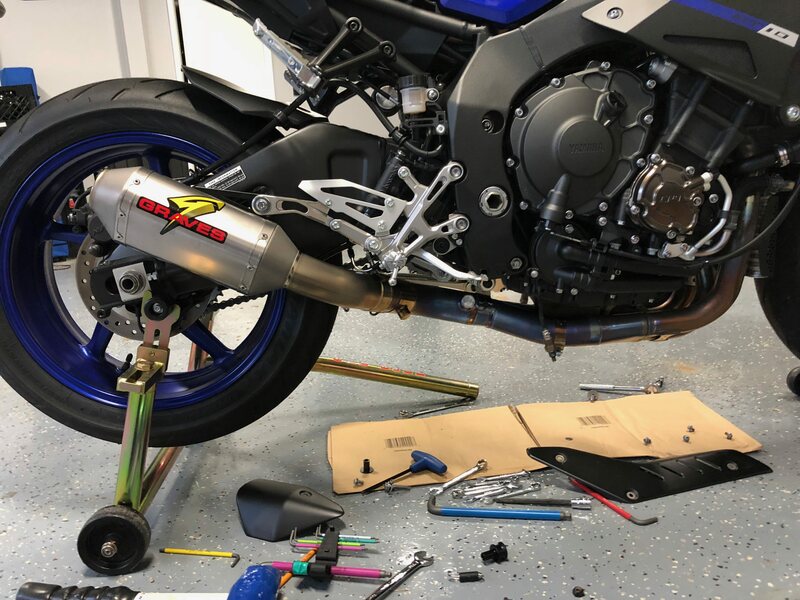 No prob, get that pipe on, with the tune it totally transforms the bike. Now I want to ride it constantly. I don't think you'll notice any dips in power for sure. My color combo is OK, but honestly I wanted the black/charcoal from 17...none left in my area so I figured if I get sick of blue, I can vinyl wrap the tank shroud and powerdcoat the wheels. Interesting. I called them months back. 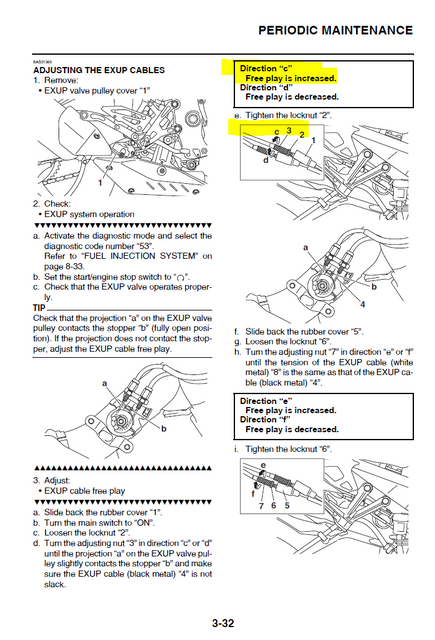 I inquired about purchasing the Flash Tune bike side flashing kit and the active tune kit. I asked if they would provide the base tune for me to work from, but the person (forget who at their shop) refused saying they are concerned with people trying to copy their work. Maybe they've changed their stance on this? Right, I should have been clear that when I got the email file, they told me the engine parameters would be blocked so I could not see them. I was OK with that, as I don’t plan to do any tweaking. They say the flash gets you 95% there, if you want to do Dyno and get a bit more for your exact bike, that would be a local shop deal.